Home › Pedagogy › Showcase Every Single Student’s Work! Showcase Every Single Student’s Work! Create normal bulletin boards for each sample of work you display. Include printed work samples of student work on the display. I had about 8-10 pieces of actual work to display per bulletin board. This wil vary depending on how many unique projects you have to display. At each bulletin board, have a display post, with a QR code linking to information about the assignment. This could be done in a wiki, a website, a blog, google pages, google docs, or any other hosted site on the internet. Since my district uses schoolloop I created a page that the code linked to. Keep the information light. The key is for parents to get a quick overview, people do not want to read text heavy information about the assignment, so keep it very short, with a brief intro. This information is only visible by QR Code. In my classroom this is what was displayed instead (the number 2 represented the station, I had 7 stations of A QR code in my classroom. Here are the steps to creating a QR code. Paste the URL code on your display paper, and voila you have a paper with a URL code linking to more information about the topic. 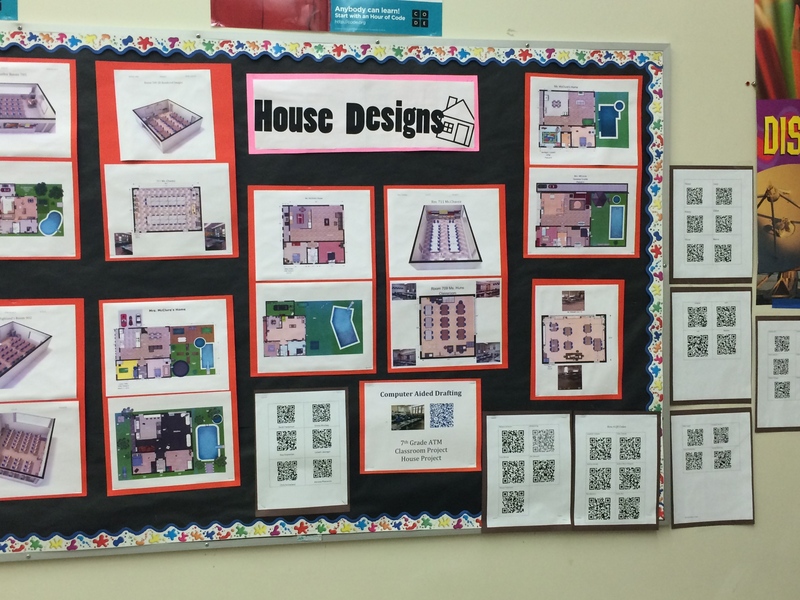 Now that your display shows information about the assignments on the board, add class QR codes in whatever visually appealing manner that you know of. 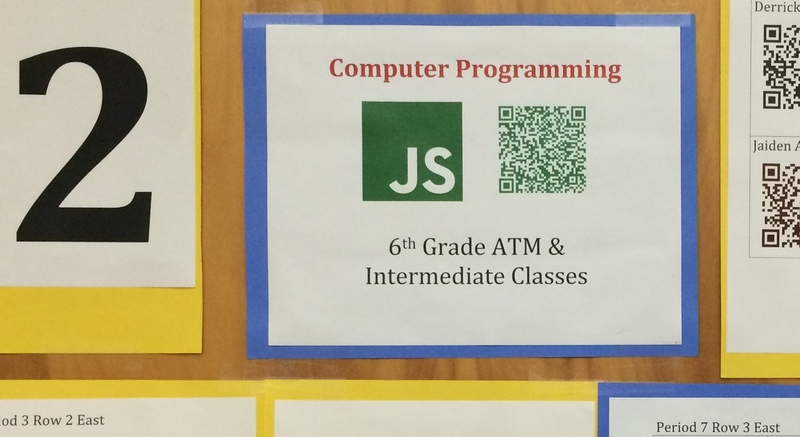 You do not have to create the QR codes for your students, have students make them! Each student makes their own QR code in the same manner of step 4 above. Then they submit it to you by email, google docs, online program. I had students turn them into their group leader and the leader gave me their qr codes in a chart. I declared a group organizer for each group of 4-6 students. All students in the group sent their QR code to their organizer. The organizer made a chart and pasted their groups QR codes to it. The organizer had warmup time for a week to get this task complete. Then each organizer emailed me the file. It worked great. The benefit of this was that the leader reminded students to get it to them and helped them out as well. Back the QR codes with construction paper, so the bulletin board looks nice. Make sure the QR code has the students name with it as well. Test run the codes before Open House. I allowed students to use their QR scanners to scan their codes to check if they worked. Students with phones shared with students who didn’t have them. 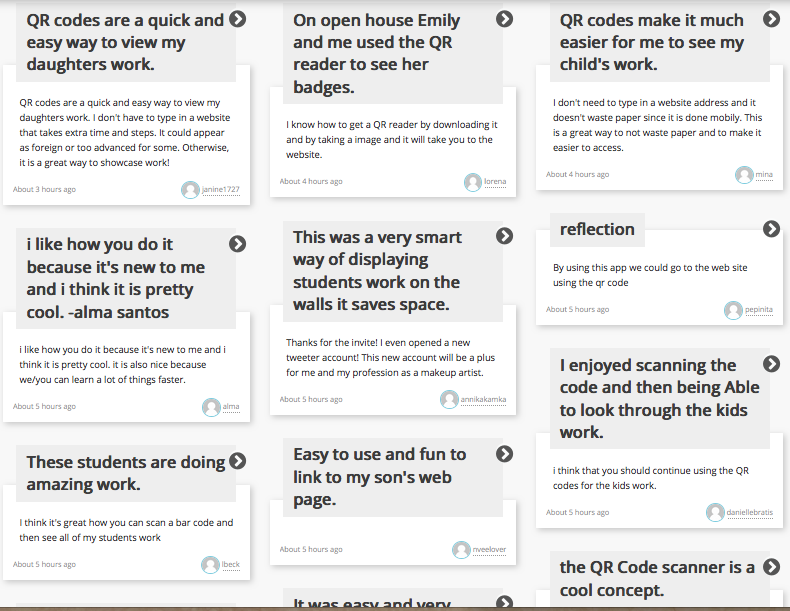 Nearly all students had a working qr code initially. A few had the link incorrect in which case, students quickly made a new code, printed it out, cut it and pasted the new code on top of the old one. Reblogged this on Anything You Like Blogging.